This year our Garden Centre continues to expand our collection of fruit, cherry and berry varieties. We have many varieties available for sale including gooseberries, currants, hardy haskap berries, and several new fruit tree varieties. Haskaps (Honeyberries) are in high demand and quantities of some varieties will be limited. Haskap is an amazingly hardy, fast growing, high yielding, great tasting berry bush that is relatively new to North America. It is an edible honeysuckle that originates from Siberia, and goes by the name ‘Honeyberries’, ‘Blue Honeysuckle’, and ‘Haskap’. Recently, it has been hybridized at the University of Saskatchewan by Dr. Bob Bors for growing on the prairies. The plants are hardy to -40 degrees C, and the flowers are hardy to -7 degrees C. Pick fruit in late June on plants that are only three years old! It tastes like wild tangy blueberries! 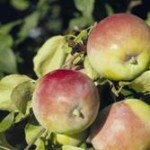 We offer an juried selection of Alberta’s best hardy apple trees for this region. September Ruby is a tried and true excellent apple. Another is Red Sparkle. We also highly recommend Kerr for a small apple crab. We make caramel mini-apples with these in the fall, and they are so delicious! Our best new variety of Apple for Alberta? Try Winter Cheeks! My girls love this new apple, which is crisp, very sweet and juicy! It is the best flavored hardy apple I have tasted! It has a deep red medium-large sized fruit in ready to pick by mid-September. The tree has good cold hardiness –zone 3, and disease resistance. I grew up on Saskatoon berries. Sweet, slightly almond flavored. They are very hardy for Alberta gardens, and produce pails of fruit from late July through early August. These are very hardy raspberries. Boyne raspberries produces dark red, medium sized raspberries perfect for jams, preserves or eat straight off the plant. Will bear fruit in the second year of growth. Souris is a recent improvement of Boyne, with sweeter fruit. In our northern climate with cold winter temperatures, hardiness is a priority for strawberry gardeners. For our pick-your own farm, flavor is at the top of the list. Covering plants with straw at the end of October is a really good idea to protect the flower buds. Summer-bearing varieties of strawberry produce fruit in July in Edmonton gardens. Honeyoe, Kent and a new variety called Cavendish are our faves. We offer the Romance Series of Hardy Cherries. Great for fresh eating, good for canning or juicing. Which one to plant? Planting all six gives a harvest from the end of July to mid-September. Each cultivar has about a three-week harvest period. Expect some fruit three years after planting, with greater yield after 5 years, and peak capacity after seven years. Growing apricot in Alberta is an act of love. Several selections are hardy enough but their blooms tend to come too early, so mulching the root system to keep it cold for as long as possible is a good idea. Manchurian seedlings will pollinate one another, and have lovely pink blooms first thing in the spring. You’ll get a small crop every five or ten years on a fully matured tree. Apricots are self-sterile – you will have to plant two, so you have a pollinator. Apricots are delicious. Totally worth the challenge if you have time and space! The Pembina plum is a sweet and juicy plum variety that has a bright reddish-purple skin and yellow flesh. Pembina trees produce freestone plums that grow up to 2 inches thick. The trees begin blooming in early spring, with fruit ripening throughout the summer until it is finally ready in early fall. These plum trees need other trees to pollinate, with plum varieties such as the Brookred Plum or Cherry Plums being ideal.